You’ll lift the professionalism of your organisation when your representatives wear a name badge. Visitors can address your staff by name which personalises your service. We can custom design the layout for your badges to ensure your corporate image is represented. 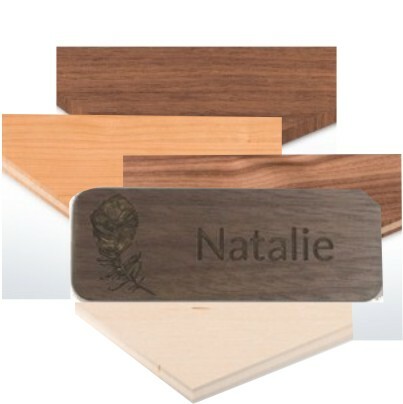 The timber name badges are made with 3mm veneered timber and laser engraved. There are 6 different timbers to choose from. The Timber name badge is 3mm thick and laser engraved. There are no standard sizes and we can cut any shape or size you desire.